Today's Mini or the Week was nominated by Tyler E, the proud owner of this amazing Tyrion model. Funnily enough I had already seen the mini on Facebook before he emailed me and had already decided I was going to use it for the Mini of the Week. Tyler had commissioned this from Javier Gonzales and I got to take a look at the creative brief he had put together for the project. Brief may be an inadequate word, because this thing was at least 10 pages (to be fair it had a lot of reference pictures included in it as well). A ton of thought and planning went into how this model was going to look before any modeling work even began. It's meant to represent Tyrion now in the Age of Sigmar so there was a ton of notes about Sigmar, Azyrheim, and the Realm of Light as well as a bunch of classic High Elf notes. Here you can see how the miniature was put together. It's really quite impressive how seamless the whole conversion is when you look at all of the parts involved. It's Valten's horse, the head and body of the griffon rider from the Island of Blood set, various parts from Tyrion, as well as several other random Elf bits. I love how much it looks like the actual Tyrion model from GW in terms of pose and composition, but 100 times better in terms of detail. Two paragraphs in and I haven't even started on the painting yet. The paint job is, of course, fantastic. The non-metallic metals are very well done and the overall color composition is ace. The glow from the sword is subtle enough to not overwhelm anything, but still convey the sense of power radiating from it. I really like the glow coming from his eyes too, a perfect touch for someone who was once the Incarnate of Light and now a god of the Aelfs in the new lore. 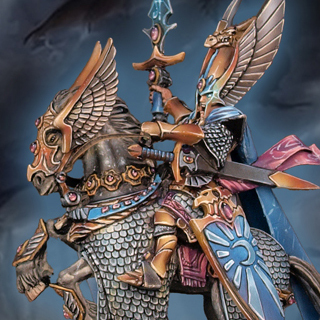 If you look at the NMM on the silver scales on the horses armor he has even painted a slight reflection from the surrounding golden armor. That's a crazy level of attention to detail, I am suitably impressed. One of the most impressive parts to me though is the freehand on the cloak. It's very thin and precise and look like constellations to me, which is a great reinforcement of the new cosmic theme in AoS. 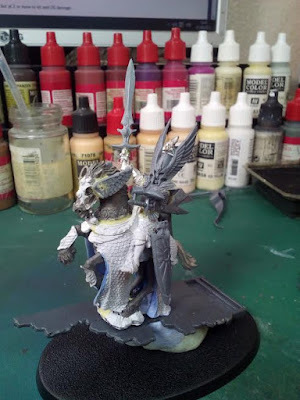 I could keep going on and on about all of the areas that stand out to me on this mini, like the horse's skin and Tyrion's red sash, but instead I will just end it with saying this mini is fantastic. 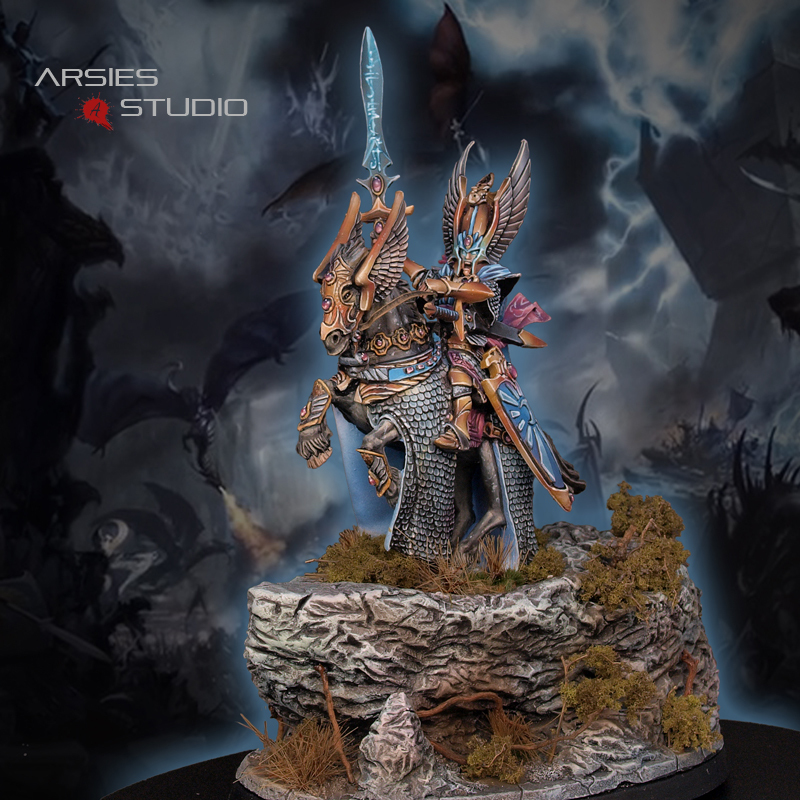 I highly recommend clicking the link to Javier's site to check out all of the other angles of this mini. A special thanks again to Tyler E. for nominating this model and providing me with a behind the scenes look at the creative process that went into making it (and for having a top notch first name). Be sure to check out more views of it on Javier's website, Arsies Studio, and show the artist some love if you like it. What do you think of this model? If you have any models or have seen any around the web that you feel deserve to be the Mini of the Week feel free to send them to me at tylerm@mengelminiatures.com with the title "Mini of the Week" and a brief description of how you painted it or a link to where you found it. 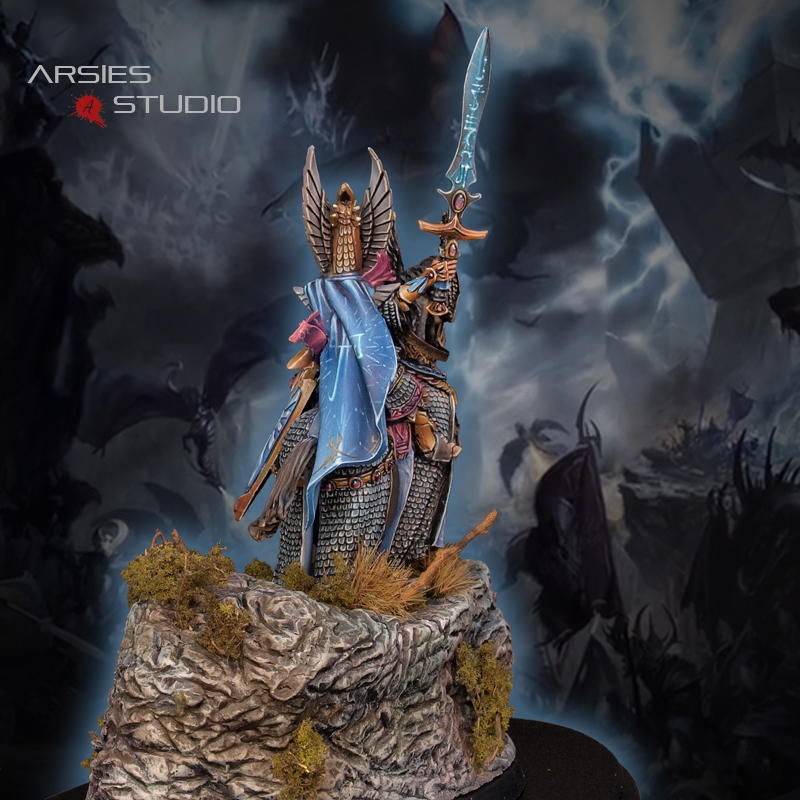 There is also a dedicated board on the Mengel Miniatures Forum for Mini of the Week where you can discuss past entries or post of minis you think are deserving of the title. IT'S DONE! Homecoming Part 7!